So last week I posted about Itacho Sushi, and this week I've got more awesome Japanese food to share with you and it's located right at the heart of Orchard Road! 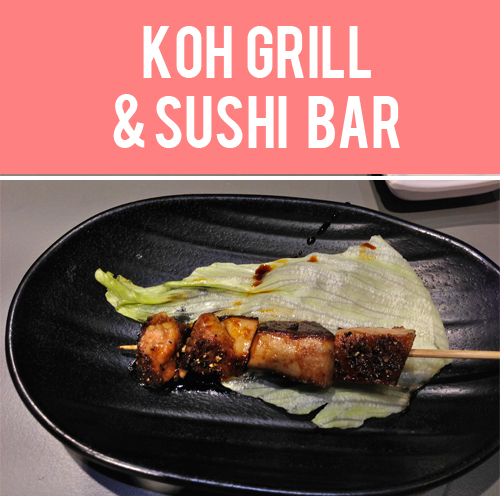 Located at Wisma Atria (same level as Food Republic), Koh Grill and Sushi Bar is known for their Shiok Maki, and it is indeed very SHIOK! 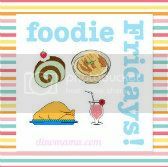 Don't be fooled by the fact that it is located in a food court and would probably just serve out ordinary Japanese fare. This place is a great hidden find! We tried their Grilled Foie Gras, and I really wasn't expecting much, but this was pure goodness. We would have ordered more except for the fact that we would have to wait super long again for it to arrive, and we all know that "waiting" and "baby" don't get along at all. Daddy Li also ordered a bowl of ramen. Didn't snap a picture of it cos he was hungry and I told him to just get started on it. It wasn't anything fancy, just your typical bowl of ramen. I suggest you skip that and try their other unique dishes like their Pitan (Century Egg) Maki and Foie Gras Scallop Nigiri. We also ordered the Crappy Maki to try! Contrary to it's name, this is one of the best soft shell crab maki we've ever tasted. It's a great combination of crispy soft shell crab and seaweed, topped with layers of swordfish belly and a generous serving of tobiko on top. Of course, we also ordered the well-known Shiok Maki. Note: You can't not order this! Right in the middle, you can find unagi and avocado wrapped with sushi rice and then slices of aburi salmon. This delightful combination is then topped with mentai mayonaise and the oh-so-awesome tobiko. All that is blowtorched to perfection and all I can say is "yum yum in my tum tum!" Just look at how generous they are with their tobiko! It's liked it rained tobiko in their kitchen or something. Plus how can you fault the combination of unagi x salmon x avocado?! They've also got a generation two version of their Shiok Maki. We've yet to try that out, but when we do I'll be sure to post about it! Food aside, I must point out that the service is quite bad. The place is basically overcrowded and understaffed in my opinion. I also think they might have a small kitchen thus the long waiting time. It was quite hard for us, or well any other customer for that matter to get the attention of the waitresses cos they were always so busy. Do also expect long lines during peak hours, and a minimum waiting time of about 20 minutes for your food to arrive. The place isn't very child friendly due to the small space and they do not have high chairs. We made do by letting Kaitlin sit on our laps. Knowing that Kaitlin can't sit still for long periods, I brought her for a walk with me while I ran some errands, and Daddy Li stayed behind to wait for the food to arrive. If you aren't pro at handling the kids while at the dining table (which many of us aren't! ), I recommend going at non-peak hours or perhaps when they babies/kids are asleep in their prams/not tagging along. Otherwise, it might get quite tricky dining there. Despite all the downsides, I still think that it's worth it to head down to Koh Grill & Sushi Bar to give their delectable makis a try!